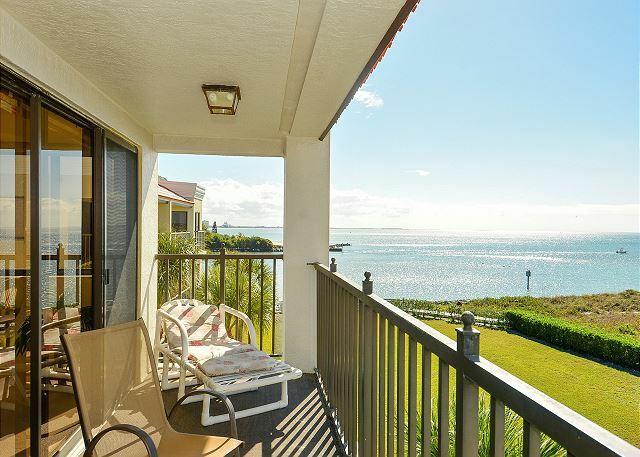 You will feel on top for the world when you see the view from this Gulf front condo. 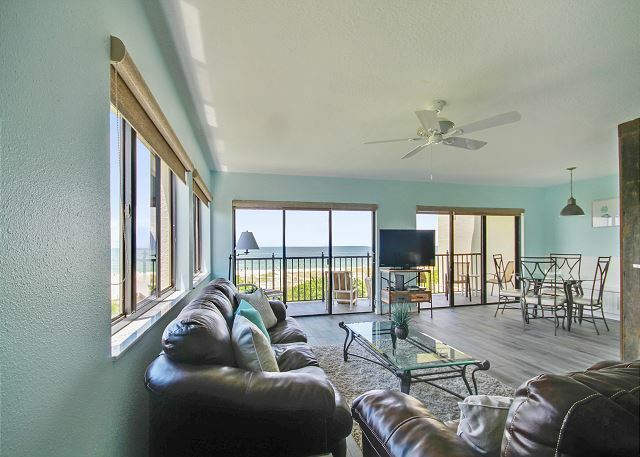 Located on the top floor, south corner you have a sweeping view of the beach and the Gulf of Mexico from your double size balcony. 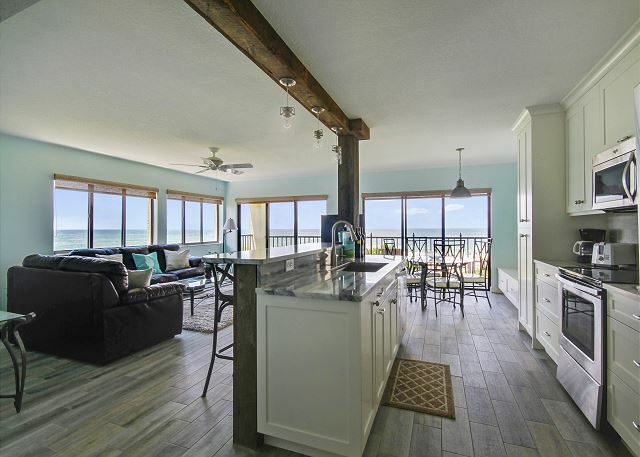 Rows of windows open the space to an expansive view of beach from the living room, dining area and the kitchen. 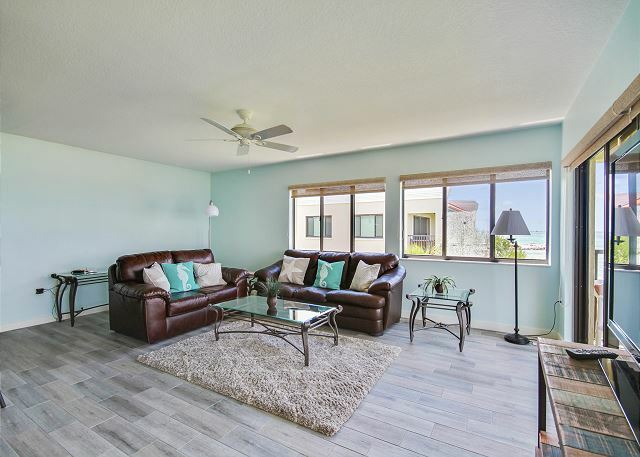 Located in the popular Sunset Beach neighborhood, this lovely condo has an up-dated, fully equipped kitchen and comfortable décor. A very good experience. We love going to Lands End. And we always love having you!! :-) Thank you for being our guest and we will see you for the next visit! We have stayed in #401 for the past 5 years. 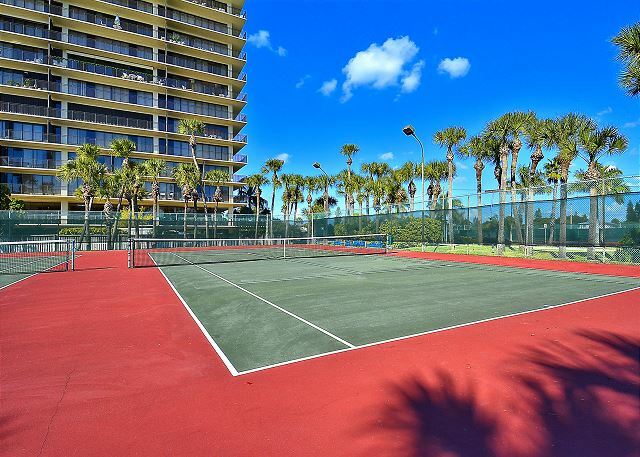 It is a great unit – larger balcony and a great view of the Gulf and spectacular sunsets. The entire condo was beautifully renovated several years ago. The living room area could use some more furniture as the only furniture now is a couch and loveseat. The balcony lounge chair is old, broken and needs to be replaced. Resort Rentals is a great business to deal with. We asked Resort Rentals if they could put a new lock on the front door as the current one was broken on the inside, replace a broken coffee maker and provide a bedside lamp. Within several days all our requests (including a new digital entry lock!) were provided. Thank you! See you next year. 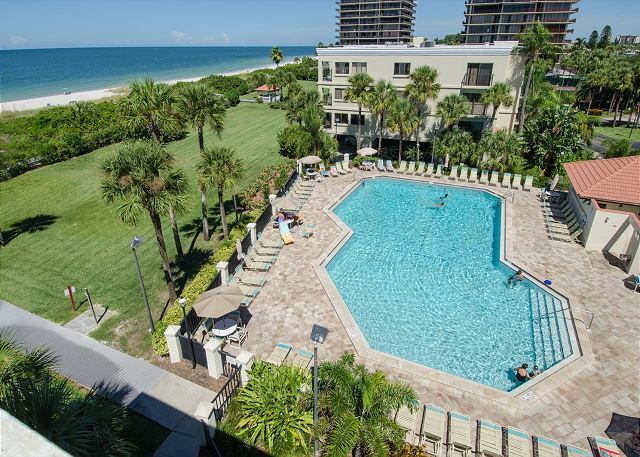 We are so glad you enjoy your time in this beachfront, corner unit!! Having that true end unit with a touch more balcony space really is a nice floor plan! :-) Thank you for your feedback from your recent stay, we have shared this with the owners for their review on items. Thank you for calling us with your needs while you were here and we are so glad we could get that all worked out for you! See you back on the beach next season!!! Resort Realty staff is awesome. Gail is such an asset to your organization and part of the reason we keep coming back to Lands End. Rudy and David are always helpful as well. This is our 4th year in #401. Each year it gets better! The renovations of last year coupled with the new sofa and love seat this year have made this condo exceptional. 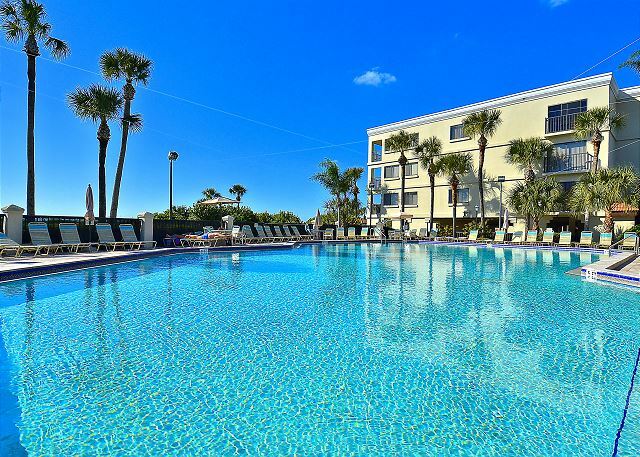 Add in the beautiful sunsets, well maintained buildings and grounds, and friendly and responsive rental management staff, and you have the perfect vacation. See you next year! We love it!!! :-) The owners really have done some nice updates along the way are we are so glad you enjoy! Thank you for being our guest and we will see you next season!! Fantastic unit! Check in staff exceeded expectations as well. Awesome!! :-) We are so glad you enjoyed this premier condo in our inventory and we hope you will be back for another visit soon! We had a great time and everything was perfect except for the elevator breaking down for 4 days. We are so so sorry about that!!! It was an unexpected issue that came up and we are truly so sorry for the inconvenience and hassle it caused!! We are glad everything else was nice for your stay and we hope you will be back for another visit. Love this place!! Have been vacationing in this area for the past several years and this by far was the nicest place we have stayed. It has now become my first choice for vacation rental. Easy check in. Condo clean. Incredible views. Can't wait until we can return. Only thing I would like to see improved are the beds. Very uncomfortable. Thank you for your post and feedback, we will be sure to take a look at the bedding but do apologize if it was not the right fit for you. Land's End really is a PERFECT spot for a relaxing getaway and we are so glad you found it! Thank you for being our guest and we look forward to your next visit. Great updated condo with lots of room! We choose this condo because we loved the updated decor and it did not let us down. Walking in you see the nice gray/brown wood looking tile planked floor. I would love to have it in my house! You go inside to an open floor plan with the beautifully update kitchen flowing into both the living room and dining room. The best part is the lots of windows to look out and see the ocean! Balcony was good size and had nice view of ocean which we enjoyed every day. Kitchen had everything we needed, even a Keurig machine! Living room furniture was comfortable. Master bedroom was quite large with lots of closet and dresser space for a week stay. Bed was good size, but could of been slightly more comfy but more than adequate for our stay. Kids room was good for our younger kids. 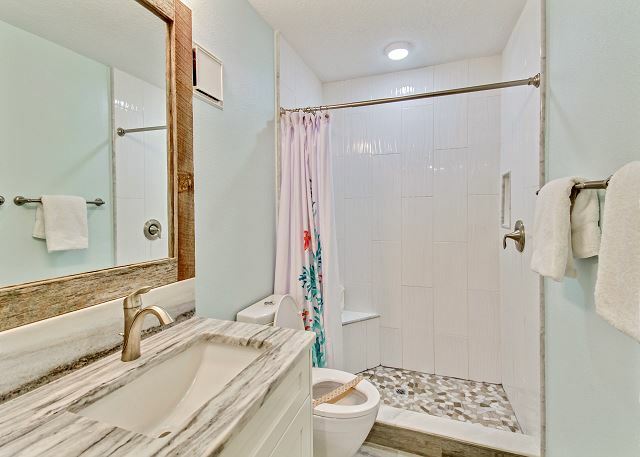 Both bathrooms were remodeled quite nicely. 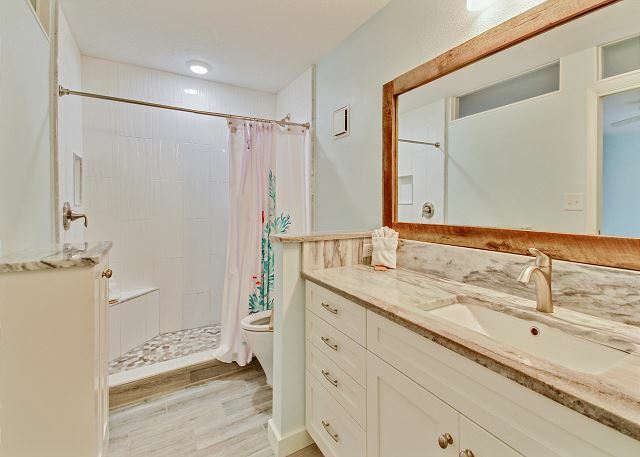 I will say from the pictures I wondered if the master bath would be very big, and I will say it was quite spacious, better than expected! Two smaller issues that I wish I could have changed, but I guess not possible because of the climate and humidity. One the refrigerator you can't make it colder and it takes a while to get stuff cold. Keep that in mind, it was fine once you left stuff in it for 4 or more hours. The other was the A/C in the master bedroom...there was only one vent going in there and it was hard to get the room cooler like the living room/kitchen. We managed, but would have preferred colder. Once again, you could only make the unit so cold because of the climater and freezing/locking up the A/C. It was manageable though. The pool at the condo was good sized with lots of chairs and the beach was very nice and not crowded at all. The condo included some things that could be used at the beach as well. Parking was nice and covered and the grounds of at Lands End were nicely kept. I would definitely recommend this place to a family of 4 or smaller, and we would go back again! 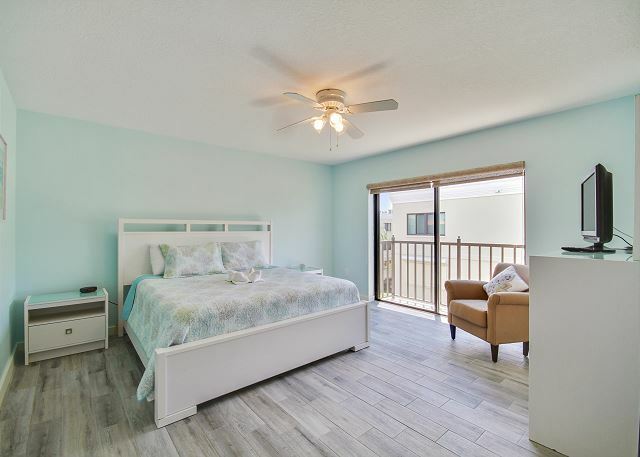 We are so glad you enjoyed this beachfront condo at Land's End, the owners did an amazing job with the updates and we are so glad you loved it!! :-) It is true that putting new food into the empty fridge may take awhile for it to cool down, that unfortunately will happen at any location as the food is normally warm/room temp. going in so it does take some time. We do keep some box fans here at the office as well, if this could help for your next stay just give us a call and we are more than happy to lend you one for the duration of your stay, based on our inventory. :-) Thank you so much for staying with us, we enjoyed having you and look forward to seeing you back at Land's End for another beach getaway!!! The nicest condo we've ever stayed at on the Gulf Coast! The open plan, upgrade finishes and decor were so refreshing and made for a very relaxing stay. Excellent location, close to everything we wanted to enjoy. The staff was friendly and helpful. I'm coming back next year!! So great to hear, we look forward to having you back!! 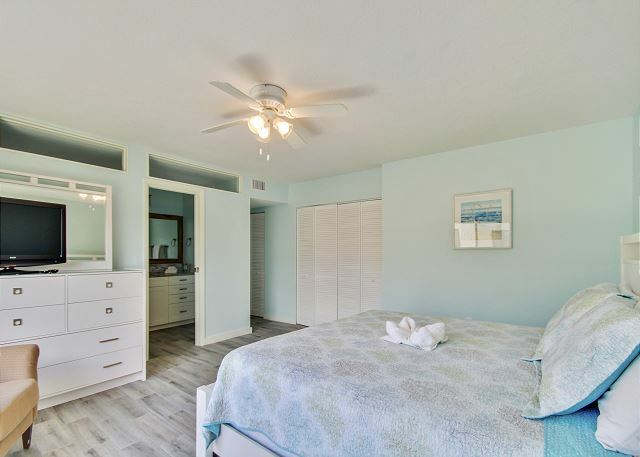 :-) We love that you enjoyed this premier condo at Land's End and just let us know when you are ready to return!!! The rental location was outstanding. The management company was great to work with. We had an issue with the AC not working properly and contacted the management company, they had service out within a couple of hours to repair. There were many great dinning selections close by. Thank you for your post! We are so glad to hear you enjoyed the location of the Land's End community, it really is a lovely spot on a great stretch of beach! We do apologize for the troubles you had with the AC while you were here but thank you for letting us know so that we could have that addressed quickly for you! Thank you for choosing to stay with us and we hope to see you back again soon. Wonderful apartment, beautiful view, perfect service of property management. But very disappointed about cleaning (see our mail to management) and Kitchen furnitures (not 2 equal glasses available). Thank you for your post and feedback. We are so glad to hear you enjoyed this premier condo in our inventory, minus a few things it sounds. We are so sorry if the housekeeping was not up to par upon your arrival! Please do not hesitate to contact us at our office if things are not right and we would be more than happy to send our housekeeping staff back out to get things corrected for you. We also keep a number of kitchen supplies here at our office so if we can help with different glasses for the condo, please just let us know! Thank you for being a guest with us and we hope to have you back again soon! Great to hear! :-) Thank you for staying with us and we look forward to another visit! We have rented 401 for four years. This past year the condo was totally renovated. The new tile floors and open kitchen are wonderful. The kitchen has new stainless steel appliances. The bathrooms with new walk-in showers are very nice. The best of all is the great view of the Gulf and the amazing sunsets. Although the condo could use a new sleeper-sofa, the furniture was comfortable and well maintained. The unit was clean and well maintained. Resort Rentals is a wonderful company to work with. Our reservation process was simple and efficient. We have found them to be very responsive to any needs we may have. For instance, there was a problem with the air conditioner which Resort Rentals addressed immediately. A repair company was on site the same day. We have already put our deposit down for next year! Thank you so much for taking the time to make this post! We are so glad you enjoyed the updates to this premier condo at Land's End, the owners really did a lovely job!! :-) We have great news in regards to your comments, the owners have put in a brand new leather sofa sleeper!! We appreciate your patience regarding the AC and thank you for calling us so that we could get everything addressed for you, we are more than happy to do so. Thank you for being a repeat guest with us and we look forward to seeing you back at Land's End for your next vacation! Always nice to hear from our repeat guests and that they had another good stay!!! :-) Thanks for the post and we look forward to the next visit! It was wonderful! Recommend lamps for nightstands in master bedroom. 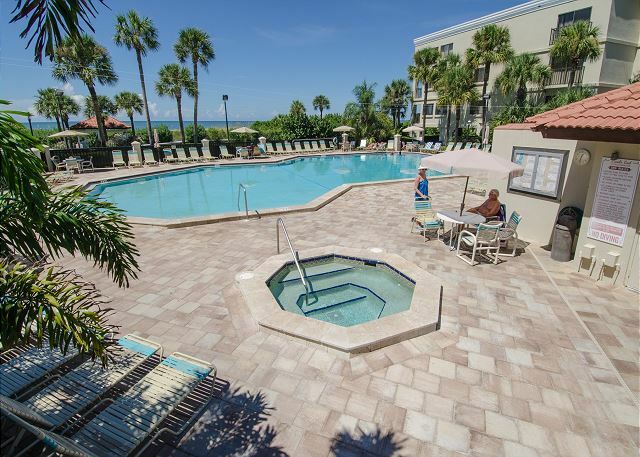 good experience; condo was clean and easy to access the beach & pool; view was fantastic. 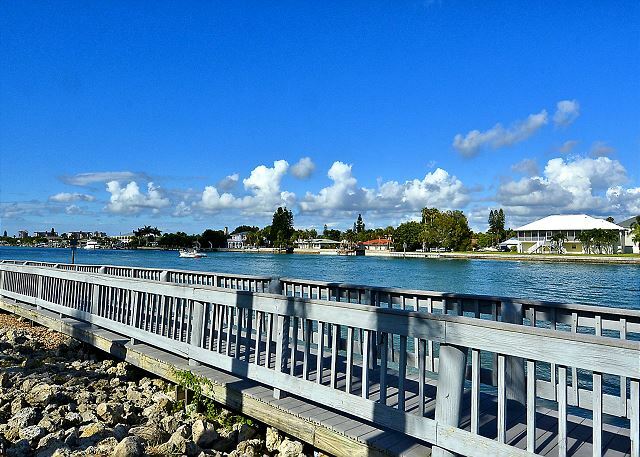 The location was also very good, close to restaurants, John's Pass etc. The couches are dated, the bedroom was very good. The condo location is quiet and peaceful. The double front balcony with side view windows was a big plus and we had amazing views. 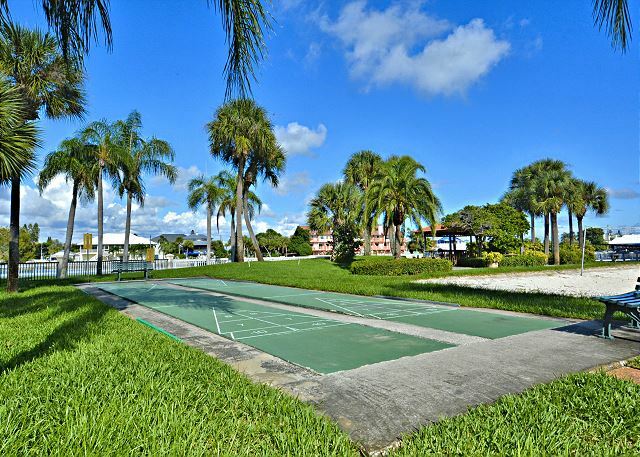 The Lands End property is in a great location and has walking paths around the property. We have been coming to Lands End for 30 years, we actually owned a u it for 20 years. It is disappointin to see the property not as kept as it used to be, it's such a jewel, still beautiful. We have rented this unit 7-401 for 4 years. We will no longer. Found another end u it that appears, at least from the pictures, to be somewhat updated and hopefully cleaner. As I bought my place the same year this was built and know not one thing has been updated or painted in 30 years. The appliances rusted and nasty. The kitchen sink and bathroom sinks are so stained, no enamel left, can't clean! The walls and baseboards are filthy, need to be cleaned.and painted. The rug is also filthy. The furniture inside a d out is, just say ridiculous. Deck rug is molded and worn through in spots to concrete. No matching deck furniture and 2 chairs needed to have inside pillows so you didn't fall through the webbing. I guess by now you get.the point. Every year the rate increases substantialy. If this family wants to be on the rental program, they need to start upgrading, at least clean and paint. We will always return to Lands End,just not to that unit. Disappointed!!! railing on balcony is very loose. needs to be repaired properly. refrigerator and stove need updating, not just painted. Overall, the experience was very good. The condo has aged some and could use an upgrade. As several reviews pointed out, the appliances and furniture are a little "tired". The location is fantastic and the unit was very clean. Property management was fantastic. Would definitely lease again, but would prefer a unit in a little better condition. Thank you for your review. I appreciate you taking the time to let us know what you liked about the condo as well as suggestions on areas that you feel could be improved or enhanced. I have passed on this information to the appropriate party so they can look into the situation. Thanks again and we look forward to seeing you again next year! This year we stayed during the week of May 16th through the 23rd 2015. These condos have been our getaway for at least 10 yrs now. The Gulf views are breathtaking. The condo is nice but is in need of updating. We've stayed in this particular condo twice over the years and it seems unchanged even though it sees the vacationer traffic it does. Other than updating the kitchen and bathrooms, the only thing that needs work is the general attitude of the "owners" concerning people enjoying the pool. In 2014 my wife and daughter were made to feel very uncomfortable at the pool and because of that, my niece refused to go there, this week. I've read this kind of sentiment in other reviews as well and am considering our options for future vacation stays. This was a lovely spot with a great view! Teresa B from Powell, OH does not recommend this vacation rental. This unit is in an ideal location. The views are breathtaking. The unit itself could use some TLC. The appliances have certainly seen better days. We've been coming to Lands End for several years and will definetly be back though. We loved Lands End. The buildings and grounds are beautiful and well maintained. Our condo had a beautiful view of the beach, channel, sunsets and dolphins! We loved our walks on the beach and boardwalk. If you like long walks, Caddies is a great bar/restaurant about a mile and half up the beach. Our condo was clean when we arrived, beds were made up with fresh sheets and plenty of towels for everyone. However, the condo is beginning to show its age: carpet is fraying at the edges, furniture is getting worn and silverware needs attention. These deficiencies, however, would not stop us from staying here again. It was really nice for family- quiet and simple. Lands End Treasure Island Fl. 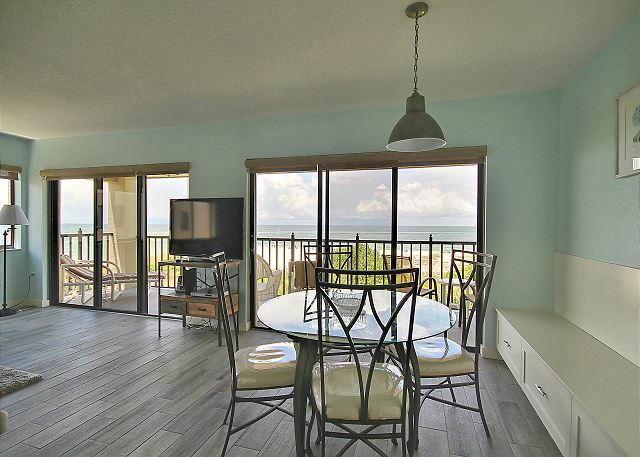 This was our second stay at Lands End condos, such a great rental property. We had a great experience booking with Resort Rentals, friendly and informative. We were able to get a very early check in that I am eternally grateful for. Our unit #401 in building 7 was spacious and quite comfortable. We were on the top floor so the view was priceless. We watched dolphins swimming by every morning while drinking our coffee on the balcony. 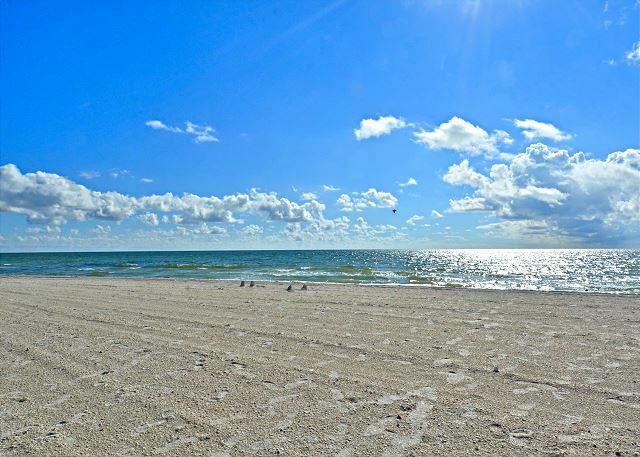 The beach is just steps from the condo, it is beautiful, clean and quiet. Caddys on the Beach is a short stroll down the beach serving up great Son of a Beach breakfast burritos and delicious morning cocktails. Our new favorite place to indulge in some all you can eat crab legs is a short drive away at R Bar, great service and great food. Get there early, they are always busy. There is great souvenir shopping at Johns Pass, and nearby jet ski and parasailing. You can't beat Lands End for location, your away from it all while still being close enough to enjoy everything Treasure Island has to offer. We are already booked for next year. The area was very nice and attractive. Lots to do in and around Treasure Island. The pool was nice and relaxing. Only negative is that the staff patrol that comes around the pool once an hour needs to lighten up. Down right rude and very vocal to anyone that is slightly aside from the pool rules. They need to sharpen their people skills. Also, thanks to property management for giving us the wrong set of keys to our condo. Nothing like having ice cream and milk in your trunk for an extra half hour because they would not bring the right keys to us. Thank you so much for your review. I am glad you were pleased with the condo and the area, I am so sorry about the key mix up upon your arrival. I wish I could say it never happens but unfortunately there are times that we do make mistakes. Again I am very sorry it happened. Please know we are constantly working to improve our procedure so things like this will not occur again. This was our third stay at Lands End. Hi I loved this unit and am going to rent again. I would recommend to the owner that the furniture on the balcony be replaced as it it very worn and cushions are dirty. Thanks so much for submitting your review. I an pleased to say all new cushions have been purchased for the balcony furniture! Thanks again and we will see you next year. Love Land's End - it's our favorite vacation place. Resort Rentals is always helpful and friendly. We have stayed in the same unit (Bldg 7, 401) several times and they still have not upgraded any of their beach furniture or their outdoor furniture. The unit does not have any "extras" but we love the location of this unit so we keep staying. We hope to be back next year. 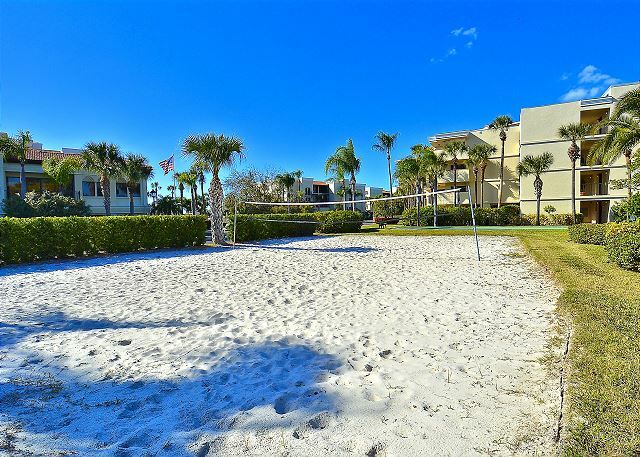 Beautiful location on a quiet beach with lots of restaurants and shopping nearby. We return year after year and always have a great time. We loved the location and we were able to enjoy the beach without having to fight a crowd! Location was great, the condo was comfortable and had most everything we needed. We will definitely choose this condo again! The kids had a great time watching the dolphins in the Gulf right from our private balcony! Just a couple of steps to the beach, which was wonderful... No worries about finding parking and if it started raining (which it did a lot) we could duck in and wait for it to quit. My one complaint is that I feel check-in time should be earlier since check-out is 10:00 a.m. why can't the cleaning staff be able to have the condo ready before 3:00 p.m.? I realize there may be a lot of check-outs on that same day but could the ones with incoming rentals may be done first?? Thanks for such a great review! Sorry we weren’t able to get you into your condo before 3 pm this year. We honestly have a great track record for getting people in earlier than they expect. We do clean all of the arriving units first but sometimes circumstances require us to use the full 5 hours in order to get things done right. Hopefully next time your condo will be ready when you get here. Thanks again! 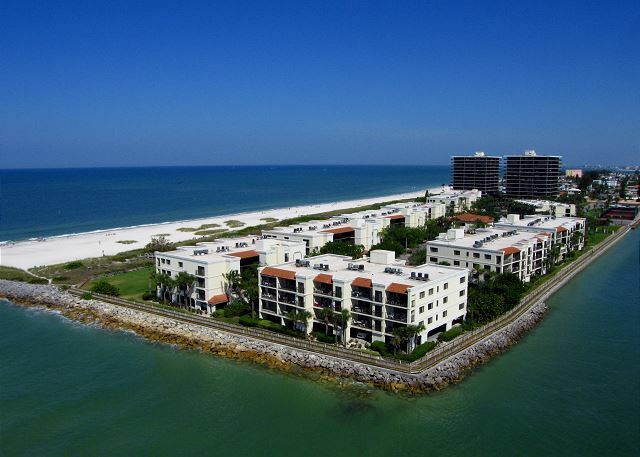 We've spent memorable days in this 1,200 sq ft +, very clean and well furnished 2 + 2 apartment facing the Gulf. It was amazing: the massive balcony offered braithtaking views of the ocean. We enjoyed the sunset from the living room, dining room and even the kitchen! 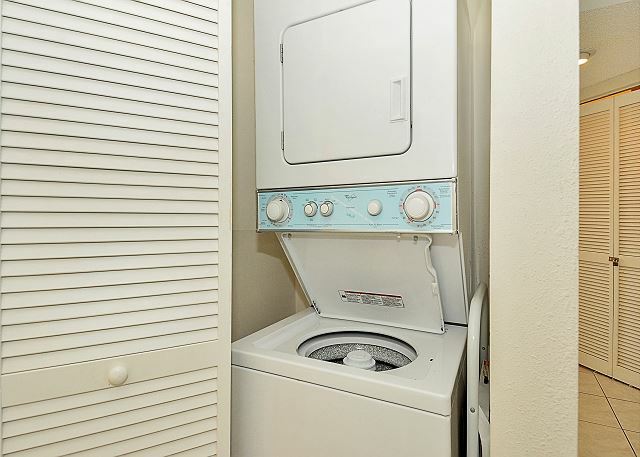 The apartment was fully equiped with appliances including a dishwasher , a washer and a dryer. Extra bed sheets, blankets and towels added to our convenience. We could just sit back and relax. What a change from cold temperature like mimus 35 celsius that we left in Ottawa! Thank you Resort Rental for the wondefull stay. We'll definitely come back. We love staying at Land's End every year. 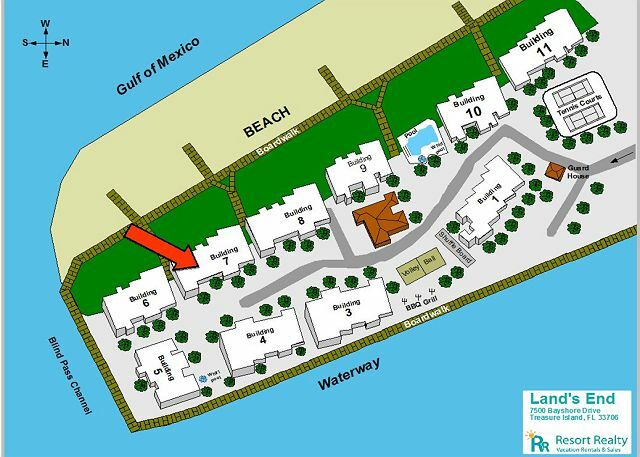 It is located and the dead end of Sunset Beach with the gulf at the front and canal at the back. 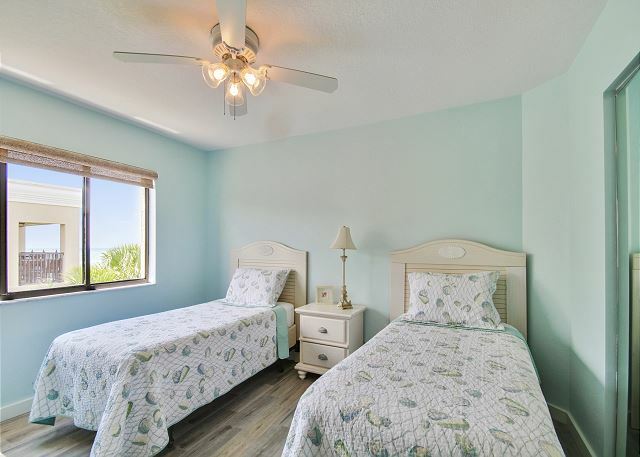 This property is located within a short drive from restaurants, shopping, etc. The sunsets are beautiful and the dolphins play in the water in front of the beach. The grounds are well kept and the property is only accessed by the residents which makes it a very safe place to stay. LandsEnd is always a wonderful place to stay.Perfect for everyone of all ages. Our unit was great, best location but the kitchen needed to be reblenished with some plates, glasses, silverware etc. Other than that, fabulous. room was very clean. the view from balcony was great. would recommend to friends and family. no problems with anything. great place!!!! Furniture and decor needs upgrade but is adequate. Overall our stay was very good. Our Apt. had a great layout. Overall condition was good. 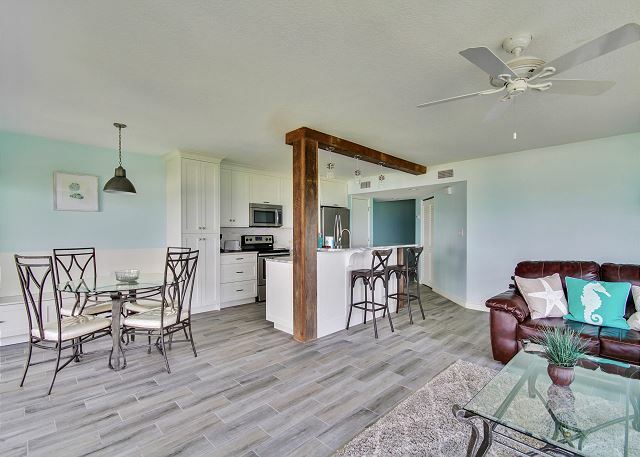 Would suggest some updating of carpeting, screen doors, outdoor furniture, and window treatments to make this a perfect vacation rental. Great place, great people. couldn't have been better. Love Land's End-have been going there for years and will continue to do so. We will recommend rental resorts to our freinds and familiy in Germany. Thank You for the Stay. Beautiful Natural Beach Habitat-Rental Company was friendly and helpful-Guards, not so friendly. Hot tub was hot and saltwater pool was warm. Porch fantastic. Master bedroom a little warm. Single beds suprisingly comfortable if your not 6 foot tall. Lands End is a fabulous setting with lovely clean beach, never crowded and with fabulous sunsets. Car is essential as you have to travel for restaurants, shops etc Some fabulous restaurants in area, especially for sea-food.Secure entry to complex, covered car parking, great pool on-site which has never been particularly busy when we have stayed. We have been 4 times and will return again. Weactually filled out a questionairre at the office with some other complaints. We didn't have enough place settings for meals and the liens were pretty poor and not enough of. Except for these things which we should have called the office about, we still love this condo. We will probably come back but might need another unit because of the air problem. What an awesome view of the gulf! Overall our experience was great. Very relaxing part of the beach. Enjoyed the wildlife and the landscaping was absolutely gorgeous. The condo offered all the necessities (including internet). The only flaw with the unit is the kitchen and bathrooms are in need of minor remodeling. This was our third trip to Lands End. We love it. Very relaxing, just what we needed. this is our 8th year at Lands End-- at Treasure Island I can't imagine staying anywhere else!